I've been thinking a bit about the power of agency and to what extent we choose happiness. Of course there are things like clinical depression and other mental conditions that affect a person in ways that no amount of positive thinking can fix. However that's not what I'm talking about. I'm talking about negative thinking. That can be fixed with positive thinking and choosing happiness and hope. In the mid-season finale of Once Upon a Time, the flashbacks featured the theme of happy endings. In Snow White and Prince Charming's flashback the Blue Fairy talks to them about their daughter Emma's destiny to save them all from the impending curse. At first Snow is worried about the uncertainty, that they don't know if the future will hold anything good for them. Charming responds that the future isn't what they planned, but that doesn't make it bad. In the end, Snow says, "I choose hope." 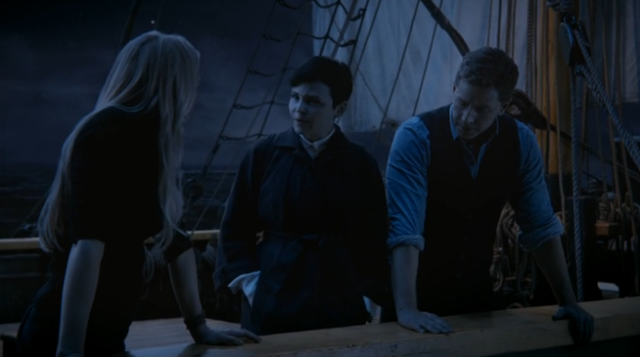 In another episode (chronologically after the flashback I just mentioned), Snow White/Mary Margaret is talking to her grown daughter Emma who is frustrated by her parents' insufferable optimism. How could they always be so optimistic when their lives have sucked so much? A line from Snow White/Mary Margaret right then hit me: "The minute I let go of the idea that things will get better is the minute I know they won't." My life hasn't exactly been ideal lately. I've been stressed by school and preoccupied with making sure that my relationships with others are healthy. Many times I've wanted to just break down in tears feeling hopeless. Other times I have felt hopeless. As hard as it is, and it is incredibly hard, I am holding onto the hope of a "happy ending" (or at least reminding myself that the semester has an ending). It's really easy to be bitter toward God or others for what's going on in my life. However, instead of being bitter I choose hope. Hope that I will get acceptable grades in my classes. Hope that I will be able to maintain healthy relationships. And hope that no matter how many tears I shed, the Savior will be there to wipe those tears away (Revelation 21:4) and comfort me. I need Him. I cannot go through this journey alone.